The live presentation of Jonathan Larson’s landmark musical might be FOX’s ticket to Emmy nominations. You want to talk about musicals that people obsess over? Yes, there’s Hamilton (still can’t get tickets to that, thank you very much) and The Book of Mormon. Sure, Wicked still has its legion of fans and a box office that will never have trouble selling tickets. One of the biggest sensations to every hit Broadway was Jonathan Larson’s bohemian masterpiece, Rent. His musical, an adaptation of Puccini’s La Boheme, was gritty and emotional a few years after huge spectacles like Les Miserables, Miss Saigon, and Phantom of the Opera dominated Broadway in the mid-to-late 80’s. Replacing tuberculosis with AIDS and setting the story in 1990’s New York City certainly helped grab audience members. As a theater kid just learning about musicals in the early 2000’s, I was very familiar with Rent. This musical’s fans are like no other. The fans live and breathe for this romantic and dramatic story. Rent Heads are a real thing, and they are still as diehard as when the musical first premiered. FOX’s live presentation is huge in scope, and it just may be the ticket to continuing the success the network found a few years ago with Grease: Live. Does the Television Academy have Rent Heads among its membership? In the Shadow of Jesus? FOX kicked down the door to the live musical presentation when it dropped Grease: Live in early 2016. While NBC was the first major network to re-introduce the medium in a big way with The Sound of Music and Peter Pan, respectively, FOX played with how to present it. NBC’s musicals were filmed in a very traditional way: on a stage with no audience while Grease built multiple sets. You could see the audience front and center enjoying the show. After our visit to Rydell High, FOX’s next live musical, A Christmas Story Live, didn’t receive as much fanfare. NBC upped the ante last year with its presentation of Jesus Christ Superstar Live in Concert. It was huge. The sets, the costumes, the stars. NBC was here to play. Since it was billed as a live concert, the audience was even encouraged to respond what was happening on stage. When John Legend’s Jesus edged towards the audience, people freaked out because they were getting close to one of the most popular musicians working today. It was brilliant. The result? Nine Primetime Emmy Award nominations, including 3 for its 3 leads–something that has never been done before with these two battling networks. Rent: Live is massive. The set, designed by Jason Sherwood, is immensely detailed while giving its audience a taste of New York. When the camera swoops underneath scaffolding to watch Mimi prance around during “Out Tonight,” you feel like you are walking through the hustle and bustle of a crowded city street. Alternatively, the intimacy of a life support is felt during the “Will I?” sequence in the first act. Sherwood created a space that feels like a huge city block. It deserves to be recognized. 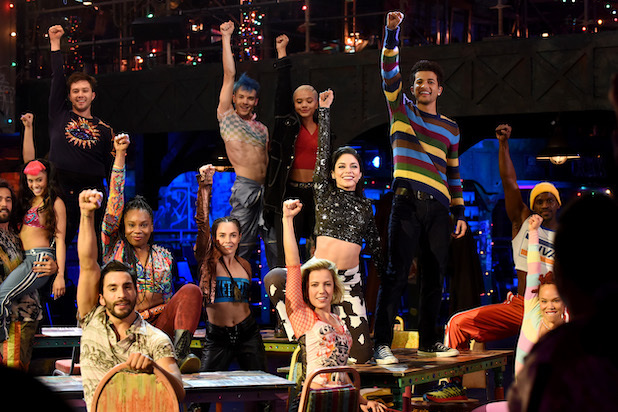 Not only was Rent a huge hit for the late Larson (who died before he saw his musical make its Broadway debut), its legacy evolves with each passing iteration. When the musical debuted in 1996, it was lauded for its representation of HIV-positive characters who lead happy lives despite being stricken with poverty and illness. By this time, the most prominent representations of HIV-positive people in film included Philadelphia and Jeffrey. Tony Kushner’s magnum opus, Angels in America, debuted on Broadway in 1993. People sometimes forget that Rent is now a period piece. It was gritty and up front about HIV for the time period, but it now serves as a reminder of what a death sentence an AIDS diagnosis was. Angel, Collins, Mimi, and Roger are all in different stages of their illness, but they constantly refer to their lives as almost being over. Roger is obsessed with securing his legacy before he dies while Angel lives in love in the moment. He is the embodiment of the show’s tagline, No Day But Today. The musical can seem like a moody rock piece to some, but to others it serves as a line of hope. I’ll Cover You…With Nominations For Mimi and Collins! If people weren’t sick of me going crazy over Brandon Victor Dixon’s performance as Judas in last year’s Jesus Christ Superstar, buckle up. I’m about to give you 525,600 reasons (I only need 1) as to why he should be nominated again this year for Supporting Actor in a Limited Series or Movie Made for Television. Did I know that Dixon would kill it? Of course I did. He’s a Tony Award winning actor, and he infuses his musical performances with an uninhibited emotional fragility that is unlike anything I’ve seen in a long time. His rendition of Collins’ aching goodbye to Angel was different than any other performance of the song. Most of the time, Collins is put center stage in a spotlight as people sing around him, but Dixon takes the notes almost off the page and rearranges them to map his own grief. People mourn in different ways, and Dixon’s interpretation is the highlight of the entire presentation. The audience was reacting to almost everything during this live presentation, but it was the singular moment where you could hear a pin drop. Vanessa Hudgens, as outspoken and liberated Maureen Johnson, doesn’t get the credit she deserves for these live musicals. She was the best performer (as Rizzo) in Grease: Live, and you can tell she is living in this role. She is comfortable in a huge arena like this, and she lets loose every time she’s on stage. She writhes, she flirts, and her duet of “Take Me Or Leave Me” with Kiersey Clemons turned me into a lesbian for a full five minutes. When you watch musicals, you want to see a performer who knows the show she’s in, and Hudgens is it. She gets flack for gaining fame for a certain Disney musical franchise, but people need to open their eyes and see what a fun performer she’s grown into. Of the other actors on stage, Jordan Fisher should be commended for taking ownership of the role of Mark Cohen. His vocal stylings and his presence respect Anthony Rapp’s original version while adapting it for himself. One thing that might stand in Rent’s way of Emmy love is how…not live the majority of the show was. After “Light My Candle,” the show cut to commercial but not before revealing a special message from the cast. They revealed that Brennin Hunt, the actor portraying tortured musician Roger, broke his foot the night before and couldn’t perform in live performance. What was presented was footage recorded from the previous night’s dress rehearsal. It’s no surprise that they had to embrace this decision because of the intricacies of the set and amount of cameras. Director Alex Rudzinski (Emmy winner for both Grease and Superstar) can perform miracles with a musical presentation. If the Television Academy is as generous as the American Theatre Wing, Rent: Live will have quite the night. * Pending official category placement.